The first Caribbean Cultural Association Parade took place last week. Central Islip, NY - September 9, 2013 - On Saturday, September 7th, the Suffolk County Caribbean Cultural Association held its First Annual Parade and Festival. The parade started on Leahy Avenue along Crooked Hill Road, in Brentwood, onto the grounds of Suffolk Community College’s Grant Campus, where the festival was held. Legis. 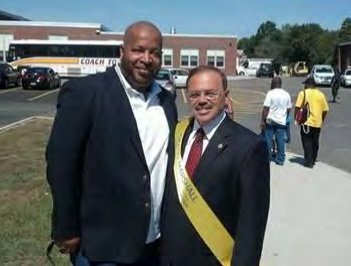 Rick Montano (D-Brentwood) was the dignitary chosen to serve as the First Grand Marshall of this important community event that gathered more than 70 thousand attendees from all over Long Island. The members of the Caribbean Cultural Association were pleased with the overall community turnout supporting their initiative to promote the richness of the Caribbean nations to all county residents, according to Anthony Ahyoung, the association’s President. The association provided activities were youths participated during the summer months in preparation for the parade and festival. Some of those activities included summer camps and the making of costumes, which were geared towards keeping boys and girls off the streets by providing them with a positive alternative. Subject: LongIsland.com - Your Name sent you Article details of "Montano Honored As Grand Marshall of 1st Annual Suffolk County Caribbean Cultural Association’s Parade & Festival"